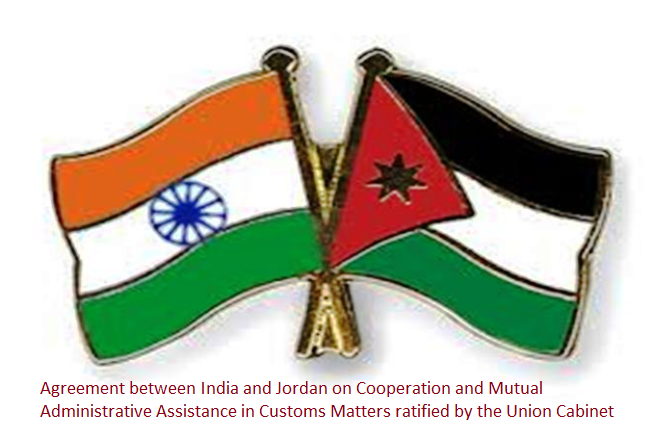 The Union Cabinet chaired by Prime Minister Narendra Modi approved the signing and ratifying an Agreement between India and Jordan on Cooperation and Mutual Administrative Assistance in Customs Matters. The draft text of the Agreement has been finalized with the concurrence of the two Customs Administrations. The draft Agreement takes care of Indian Customs' concerns and requirements, particularly in the area of exchange of information on the correctness of the Customs value, tariff classification and origin of the goods traded between the two countries.